Head Office: Unit 15, 2/F, Kin Fat Industrial Centre, 13 Kin Fat Street, Tuen Mun, NT, Hong Kong SAR, China. A set of injection moulded, transparent polycarbonate panel linked up by horizontal axis to form a continuous rolling curtain. Injection moulded transparent polycarbonate panel stainless steel tube / or aluminium tube horizontal axis. Polycarbonate panel of the CSIIA, CSIIsA satisfies the tests in accordance with BS476: Part 7: 1997 "Method for classification of the surface spread flame of products" and BS6853: 1999 Annex B.2 "Determination of weighted summation of toxic fume, R" respectively. The aluminium horizontal / vertical axies can be treated with natural colour, bronze, mat balck or champagne gold anodized, which enhance the room of shop front design and outlook unity with selective colour combination. 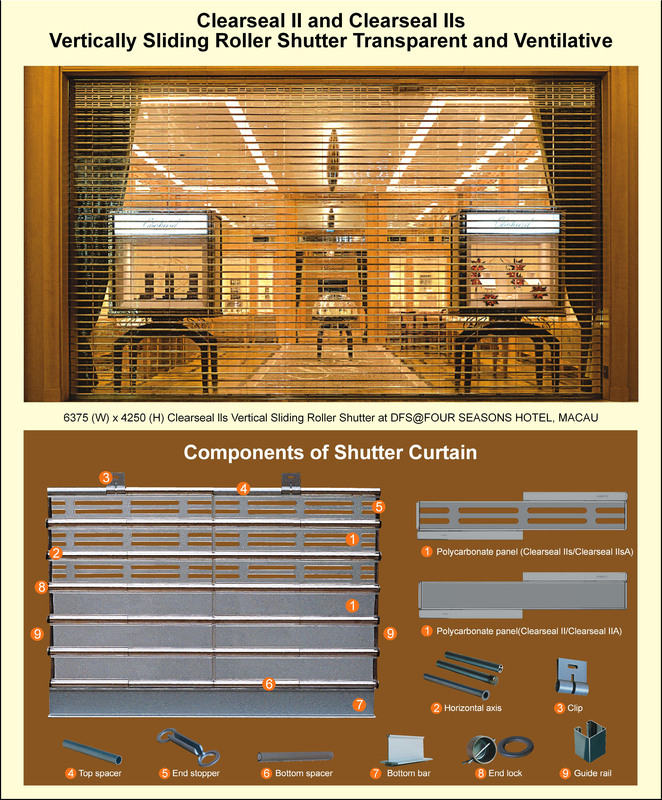 The shutter curtain is formed of injection moulded polycarbonate panel, the panels are with high transparent and UV resistant. We sent samples of our polycarbonate panel to Hong Kong Standards and Testing Centre for test, test report no. : HC115657, the result shows the polycarbonate panel will not discolour or lessen its transparency even in strong sunlight or 60°C spotlight for three year. Injection moulded polycarbonate panel made with runner mainflold system, it gives unity in thickness and crystal-clear appearance. Each panel is up to 462mm wide which is remarkable among the category. Only one extra long joining tube on each side of the polycarbonate panel, it makes a small amount of gaps hence could greatly reduce the dust problem. The extra long joining tube can resist high tensile and impact load. The 20.7mm outer diameter of the joining tube makes it suitable and yet elegant for both large or small spans shutter. The metal horizontal axis is made of quality aluminium alloy or stainless steel tube, there is no corrosion problem on our CSII and CSIIs shutters. 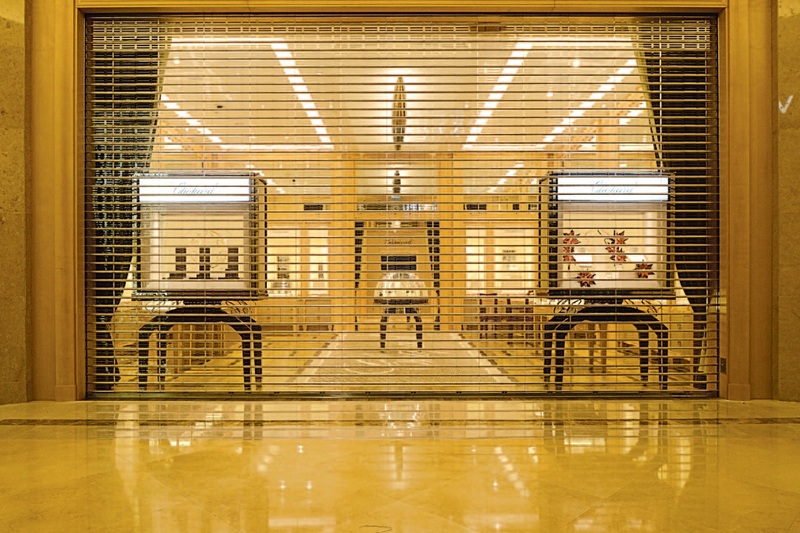 The aluminium horizontal / vertical axis can be treated with natural colour, bronze, mat black or champagne gold anodized, which enhance the room of shop front design and outlook unity with selective colour combination. Each injection moulded panel is covered with protective layer during installation and decoration period to ensure that no dust stick on it, the layer would be removed after the decoration has all been finished. Our CSIIs polycarbonate panel , in the moulding provess, each panel has six small oval-shaped holes. When all the panels are connected, you can see groups of parallel lines making some beautiful pattern, and they are simply composed of the oval-shaped holes. Those small oval-shaped holes are even smaller than our plams, which make the total thickness into 4mm. This strongly holes, which make the total thickness into 4mm. This strongly increases the tensile strength and impact resistance of the CSIIs polycarbonate panel. Ventilative sales are energy saving, at the same time comply fire requirements. Ventilation is rather important in a mall with central air-conditioning system. Air could flow in and out of the shops even when the shutters are closed, that keeps the shops always be filled with fresh air. Installing a security shutter composed of CSII and CSIIs panels are an excellent idea for catering shops, cosmetic shops and boutiques. We can also compose metal grille slats and CSIIs slats to build a security shutter, this will increase the airflow and suit your special needs.